Professor Ramon Espinel, Dean Faculty of Life Sciences at ESPOL, and former Minister of Agriculture for Ecuador explored the unique differences in smallholder agriculture as it pertains to different parts of the world. While smallholders in the United States may have access to several acres of land, smallholders in less developed countries (LDCs) are better described as family peasants. Family peasants are apparently doing better in biodiversity conservation than the industrial agriculture as found in a large-scale study in Ecuador with four hundred family farms. The negative externalities of industrial agriculture due to pesticides and land degradation are intuitively reversed by the multi-crop ecosystem prioritised by peasant smallholder farming systems. While it is important to understand that smallholder agriculture is not sustainable without biodiversity the reverse is also true. Experts in agriculture and the broader bioeconomy spectrum will do better with a new paradigm of scientific inquiry that investigates the association between multiple species of plants, animals and human management. Since peasant farmers with smaller farm sizes comprise more than eighty percent of farmers in the world, universities will do well to pay attention to the unique role they occupy in biodiversity conservation. Not all African Agriculture is Organic? Contrary to what you might have believed, only 3 percent of African agricultural land is involved in organic agriculture. If you are as surprised as I am, you might have heard the quote by some experts that “Organic Farming is… what most African smallholders practice over decades.” This quote is not backed with evidence as argued by Professor Bernhard Freyer of the Department of Sustainable Agricultural Systems, University of Natural Resources and Life Sciences (BOKU) in Vienna. 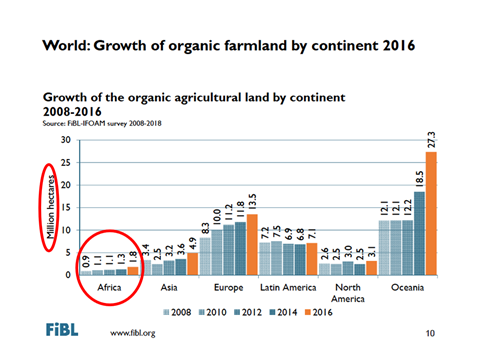 Furthermore, the subject of organic agriculture becomes more interesting when you understand that Africa has the least growth of organic land (Figure 1). If Africa continues cropping without sufficient inputs of nutrients and organic matter this will lead to continued land degradation that renders many soils unresponsive. This is particularly important because land degradation already cost the world over 10 trillion dollars yearly (Environmental Sustainability, the Guardian, September 2015). While many agricultural experts are preoccupied with yields per hectare, Professor Freyer asks the big question that before we discuss yields per hectare, we should ask how many hectares of land will be left as a consequence of land degradation? While you may be tempted to think that all African agricultural practices are organic the systemic approach to organic agriculture has specific bounds. Organic agriculture pertains to the agricultural system being practiced, the ethical foundations surrounding them, the land use type and questions surrounding carbon and Nitrogen fixation in the soil, biodiversity conservation and micro-organisms. African farmers keen to fix nitrogen in their soils should ensure that between 10–25 percent of legumes are planted on such soils. This is because at this legume threshold, you can guarantee nitrogen fixation in the soil. Crop rotation is recommended and bush burning is strongly discouraged. More effort is needed in recycling food, forage and processing of residues for organic fertilizers in order to lead away from nitrogen fertilizers. Organic matter management requires precise field protocols for farming systems and an organic matter approach. The olive branch is that the African continent can be 100% food self-sufficient by conserving the richness of environmental resources and beauty and eventually become a net exporter of high-quality agricultural products. The present trend of agricultural practices are largely not geared towards nutrition and health and this bears huge consequences. Dr. Namukolo Covic, the country coordinator of Agriculture for Nutrition and Health (A4NH) and Dr. Stineke Oenema , coordinator of the United Nations Standing Committee on Nutrition both join voices to urge academia to be more proactive in solving global nutrition problems. While undernourishment is a predominant problem in Sub-Saharan Africa (SSA), the rising problem of obesity reflects the other side of the coin of inability to attain positive nutrition outcomes. Undernourishment measured as stunting among under 5 year olds in Zambia was found to reduce between 2000 and 2015 (FAO, 2017) but two things are noteworthy. First, there are gray areas requiring more research to understand the drivers reducing undernourishment. Second, the major driver reducing undernourishment was treated bed nets. This reiterates the need for a multidisciplinary approach to solving global problems. In Burkina Faso, researchers recorded higher rates of reducing undernourishment when water, sanitation and hygiene (WASH) interventions are combined with lipid-based nutrient supplements (EHFP) in agricultural and nutrition programmes. However, there is more that can be done for nutrition on a global level. 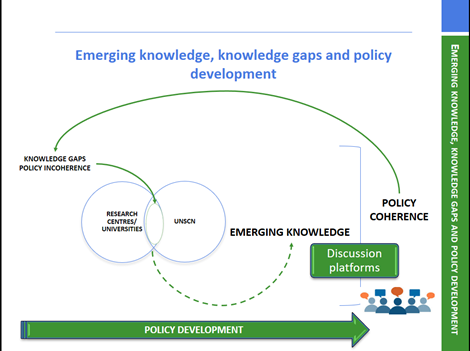 In accordance with the theme of the Tropentag 2018 conference, there’s a pressing need for universities and research institutes to collaborate with universal agencies like the United Nations and CGIAR to create new knowledge (Figure 2) that helps to understand the best solutions to the nutrition problem. The consensus was that nutrition is too important to leave to nutritionists. Future agricultural programmes that are keen to incorporate nutrition-sensitive programmes should consult the FAO checklist in order to incorporate updated nutrition objectives and indicators. Finally, understanding the role of peasant farmers, appreciating the gaps in organic agriculture and the need for nutrition sensitive agriculture programmes will be crucial for a sustainable global agriculture. The future awaits early career researchers that are ready to embrace the multidisciplinary approach required to answer the big questions that confront global agriculture. Written by Kehinde Odeniyi (Student reporter and Conference participant) as a summary of the opening Keynote addresses at Tropentag 2018.